The Everest Base Camp Trek is one of the most popular trekking tours of Nepal. The powerful beauty of the Himalayas, amazing Khumbu region, going trough mountain valleys with Sherpa Culture slowelly up to 5500 meters above sea level makes it the trek of a lifetime for the trekkers.This trek is was done the very first time by Sir Edmund Hillary and Tenzing Norgay Sherpa in 1953. Today a thousands of visitors do the same trek as the most exotic and beauteous journey of your lifetime! The Everest Base Camp Trek starts from Kathmandu, the capital of Nepal. The next day we will take short flight to Lukla, which offers a fresh Himalayan environment. The trekking takes you through many famous Sherpa villages and settlements like Namche Bazaar, villages Tengboche and Dingboche, pass Sagarmatha National Park which is a UNESCO Natural World Heritage Site, vantage point of Kalapatthar and enjoy panorama of the entire Mount Everest massif form there, visit the Tengboche Monastery as well as The Khumbu Glacier with its famous Icefall. This tour is a moderate trip grading so, you do not need to have previous trekking experience in order to take this trek route. 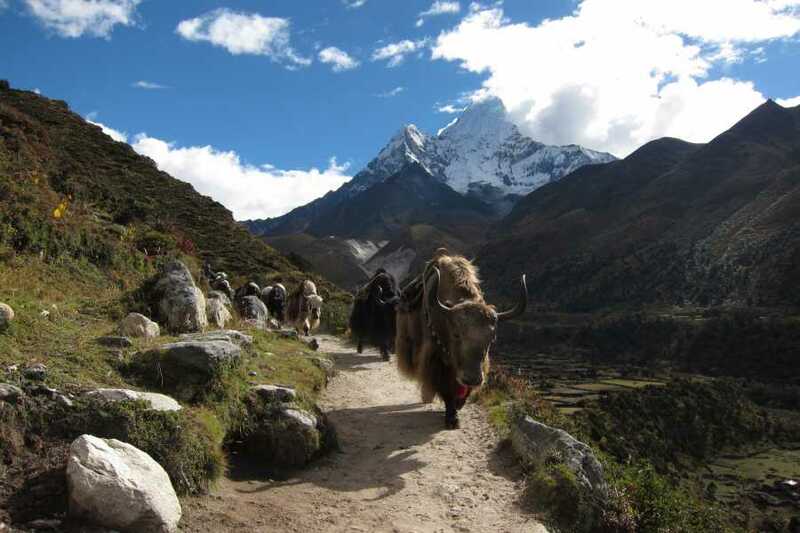 Khumbu’s Landscape consists hills and flat-lands. Guests will mostly do up-hill and down-hill trekking in relatively flat-lands includes acclimatization time. Upon our arrival in Kathmandu, a representative from Royal Nepal Adventure will pick us up from the airport and take us to our hotel. We prepare for an early morning departure, amid pre-dawn darkness and cold temperatures (-10 to -14 C). Plus, there is always the potential for chilly winds which are quite common. Familiar peaks such as Lingtren, Khumbutse, and Changtse tower to the east even as Everest begins to reveal itself. But, it is upon reaching Kala Patthar that we get to see360 degree up-close and formidable views of Mt. Everest. We take pictures, enjoy the magnificent mountain panorama, and then return back to Pheriche for a good night's rest. Those participants who will visit Everest Base Camp today will have an early breakfast to start early as Everest base camp hike takes longer than the hike at Kala Patthar. After returning to Gorak Shep, both the groups will have lunch together; afternoon time is taken to descend down to Pheriche for a good night's rest. We catch an early morning flight to Kathmandu after our long mountain journey. After reaching Kathmandu, we can take a rest or do some souvenir shopping. If we want to explore any other areas of Kathmandu, we may do that today. There will be a farewell dinner in the evening to celebrate the successful completion of our journey. Overnight in Kathmandu. Your adventure in Nepal comes to an end today! There is nothing to do but trade emails with your travel companions and organize your photos. A representative from Royal Nepal Adventure will take you to the airport, approximately 3 hours before your scheduled flight. On your way home you'll have plenty of time to plan your next adventure in the wonderful country of Nepal.